The Nissan Sentra has targeted budget conscious buyers since the early 1980's. With a high fuel efficiency and spacious cabin, the Sentra could be a great option as a used vehicle. In addition, the low upkeep costs are another plus that grabs the attention of many customers. In 1987 Nissan created the Sentra with a variety of body styles. Whether you were in the market for a wagon or sporty hatchback, Sentra could provide. Its engine output for those models were a modest 69 to 90 hp, but the reliability of those vehicles are still seen today with many of them still on the road. The later models of the Nissan Sentra (2000-2006) became available in sedan form only. There are different trim options along with an automatic or five speed manual gearbox. The upgraded models were also equipped with 17 inch wheels, six speed manual and 175 hp. In addition, upgraded technology features like Bluetooth became standard on models after 2006. 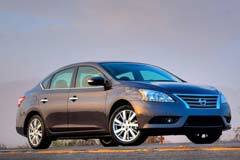 The Nissan Sentra may have stiff competition from other mid-size sedans. However, for those looking for a reliable used vehicle with good gas mileage and easy maintenance, the Sentra may be a good choice. 2017 Nissan Sentra SV 2017 Nissan Sentra SV with Sunroof & Alloy Wheels VERY LOW MILES!! 2015 Sentra S uper Black Nissan Sentra with 31825 Miles available now!